Facebook is always coming up with amazing features that almost all users would want to get feel of. To have it, Slideshow was first made known or introduced in the company's standalone photos app Moments. And this builds on social network's feature in order to create short films from whatever you share as a user, and with the hope that any user will share those videos and keep the cycle going at an ever-accelerated pace. Facebook team always working to see to the satisfaction of their users, they keep developing new things everyday, isn't that great? Their development on Android and iOS features regarding to Facebook chating apps are really helping. 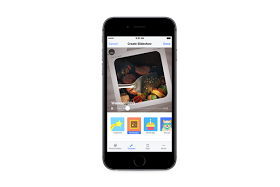 Now, the very trend on point is on the new features known as slideshow coming for iOS devices regarding to Facebook. This feature is coming this week and its such that takes your mobile photos and videos turning them into short clips you can customize with different music and themes. Facebook will do this clip automatically with a pre-made slideshow as long as you have taken up to 5photos or videos within the period of 24 hours. You really can try one by yourself by going to News feed, tap "try it" and you will be able to make one. Don't forget to share and also to tell us your idea on this development.